A beautiful landscape and kind people. A comfortable port in a comfortable island. which is just one hundred and a few dozen population though, in Tokara islands. on the top of the hill forty minutes walking away. It feels good to walk and climb up through trees. You will see the local Tokara horse. There is also an astronomical observatory which I haven’t visited yet. Berth: Rounding the end of the breakwater, enter into the left side. The left side breakwater is the quay for the ferry boat, which also has some fishing boats. 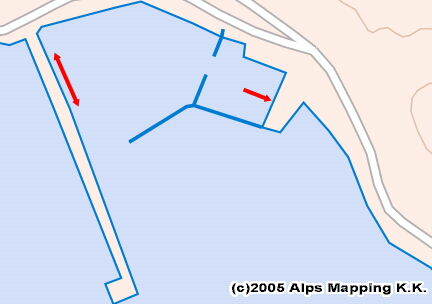 then there is the innermost boat pool, which is your berth area. at the center of which around the steps has enough water depth for your mooring. and driving down to give me a dock line. People were kind. 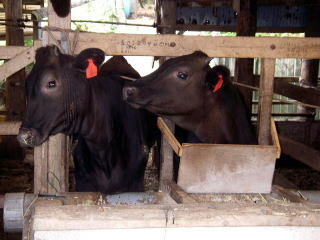 I appreciated the young guy, who had a motorboat named “Wadatsumi” on the right side. 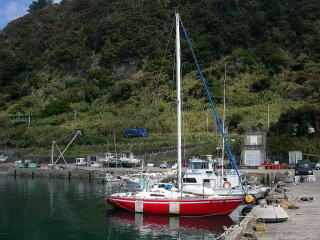 The port area was small and sparsely crowded with fishing boats. As I left next morning, it is not sure though, there might be other boats in other seasons. No shop. There looked no fuel service. You have to use a toilet at a construction work office. 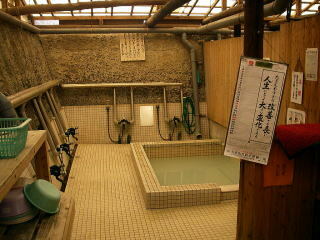 There is a clean hot spring 5 minutes away. I felt refreshed with the creamy white hot spring. The creamy white hot spring.